Fall is here and that means football season is in full swing! Luckily for us, football season usually means parties with great food. Sometimes that means family get-togethers at home. 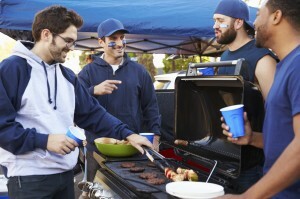 Sometimes that means hauling our barbecue to the stadium for a good old fashioned tailgate cookout. Combine the beer and onions in a large pot; bring to a boil. Submerge the bratwurst in the beer; add the red pepper flakes, garlic powder, salt, and pepper. Reduce heat to medium and cook another 10 to 12 minutes. Remove the bratwurst from the beer mixture; reduce heat to low, and continue cooking the onions. 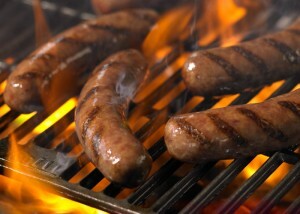 Cook the bratwurst on the preheated grill, turning once, 5 to 10 minutes. 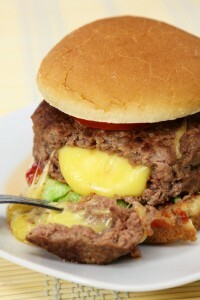 Serve with the beer mixture as a topping or side. Cut the slices of bacon on half. In a large heavy skillet, partially cook the bacon over moderate heat to render some of the fat without allowing the pieces to crisp. Remove the slices as they are done and drain on paper towels. They will still be floppy and look unappetizing. They need to be soft so you can wrap them around the shrimp, and you will finish cooking them on the grill. In a medium bowl, combine the paprika, cayenne, curry powder, cumin, coriander, salt and black pepper. Stir in the olive oil, sugar and lemon juice. Add the shrimp and partially cooked bacon, and toss well to coat. Let marinate at room temperature for 30 to 60 minutes, stirring occasionally. Meanwhile, light a charcoal fire. Remove the shrimp from the marinade, reserving the marinade. Wrap a half-slice of bacon around each shrimp and thread on a skewer. Overlap the ends of the bacon on the tummy of the shrimp, poking the skewer through that point and out through the back. You can also use a toothpick to individually secure the bacon, if you are using a wire basket or other means to keep the shrimp from falling through into the fire. Place the skewers on a sheet pan covered with aluminum foil and drizzle the remainder of marinade over the shrimp. Brush your grill rack with a little oil and set it about 5 inches from the glowing coals. Grill the shrimp skewers for about 5 minutes, until the bacon begins to be crispy. 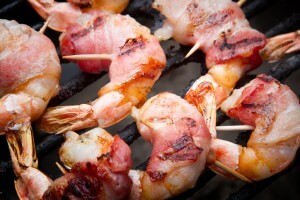 Turn skewers over and grill until the bacon is browned, and the shrimp is opaque throughout. Serve hot or warm. 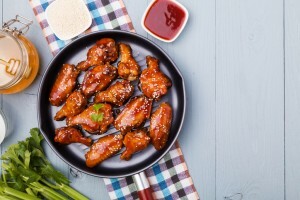 When the wings are done baking, carefully dip them in the sauce, and place them back in the oven for another 5 minutes, or until the sauce is bubbling and enjoy! Remove the membrane from the back of the rack, and trim the ribs of excess fat. Rub each rack liberally with the rub. 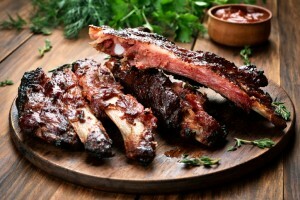 Wrap ribs in foil or place in a large container and store in the refrigerator overnight (optional). Remove the ribs from the fridge while preparing the smoker or grill. Fire up smoker or grill to 225 degrees, adding chunks of smoking wood chunks when at temperature. When the wood is ignited and producing smoke, place the ribs in the smoker or grill, meat side up, and smoke until the ribs have a slight bend when lifted from one end, about 4-5 hours for baby backs or 5-6 hours for spare ribs. If you’re looking to win a tailgate cook off contest, choosing any one of these as your entry will give you a great shot at taking home the prize. If not, you’ve still made an amazing dish that will keep your party guests happy and coming back for more.